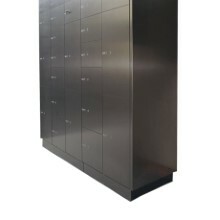 Elegance meets a user-friendly approach to high security for personal valuables: Fichet-Bauche’s safe deposit lockers deliver an unrivalled user experience. Many bank customers rely on safe deposit lockers to protect their valuable possessions, including gemstones, family heirlooms, wills, property deeds, and other confidential documents, from theft. But they also want ultra-secure and private access to their valuables in an easy-to-use and convenient solution. The Fichet-Bauche safe deposit lockers combine performance and accessibility to simplify the customer experience as much as possible. Each unit optimises personal comfort via an elegant design and ergonomic features.